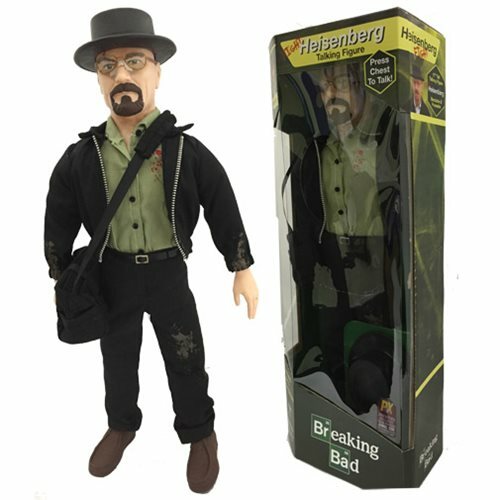 This Breaking Bad Previews Exclusive Fight Heisenberg 17-inch Talking Figure was made exclusively for San Diego Comic Con. It features a highly distressed version based on the final season of the show. Many classic quotes from the show, and unrated language make this even more exclusive. Limited edition of 1,000 pieces. Ages 17 and up. "We tried to poison you. We tried to poison you because you're an insane degenerate piece of filth - and you deserve to die." "How long did those guys chase you? Huh? Because the way you describe it they gave up pretty damn easy. No, no, this whole thing, all of this, is all about me." "I watched Jane die. I was there and I watched her die. I watched her overdose and choke to death. I could have saved her but I didn't." "Are you lying little ****! You had one thing to do! One thing! That is the one thing I might add - that would save our lives. You were right there, you were in his house, and you didn't have the guts to do it." "You clearly don't know who you're talking to, so let me clue you in." "You're never gonna see Hank again. You let that sink in." "Maybe now you'll listen. Maybe now you'll use your damn head!" "I told you Skylar, I warned you for a solid year. You cross me, there will be consequences. What part of that didn't you understand?" "You know you never believed in me. You were never grateful for anything I did for this family." "Now you tell my son what I do you stupid b****!" "If you don't know who I am, maybe your best course would be to tread lightly." "I'm the one who's the father here."